William George Armstrong, 1st Baron Armstrong CB FRS (26 November 1810 – 27 December 1900) was an English industrialist who founded the Armstrong Whitworth manufacturing concern on Tyneside. He was also an eminent scientist, inventor and philanthropist. In collaboration with the architect Richard Norman Shaw, he built Cragside in Northumberland, the first house in the world to be lit by hydroelectricity. He is regarded as the inventor of modern artillery. Armstrong was knighted in 1859 after giving his gun patents to the government. In 1887, in Queen Victoria's golden jubilee year, he was raised to the peerage as Baron Armstrong of Cragside, becoming the first engineer – and, indeed, the first scientist – to join the House of Lords. Cragside The House of Lord Armstrong (1810-1900) investor, engineer and armaments manufacturer. His hydraulic and hydroelectric inventions were applied throughout his estate. The house was the first in the world to be lit by electricity derived from water power. High Bridge. Lord Armstrong 1810-1900. William George Armstrong's water-powered rotary engine was built here at Henry Watson's works, 1838. 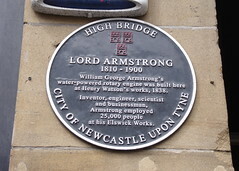 Inventor, engineer, scientist and businessman, Armstrong employed 25,000 people at his Elswick works. The Banqueting Hall. Built in 1860-62 by Sir William (later Lord) Armstrong for entertaining; John Dobson, Architect. Lodge and extensions, 1869-70, by Norman Shaw, Architect. 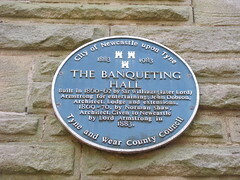 Given to Newcastle by Lord Armstrong in 1883. Armstrong House. 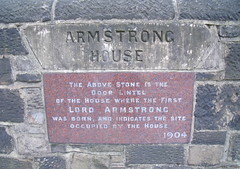 The Above Stone is the Door Lintel of the House where the First Lord Armstrong was born, and indicates the site occupied by the House. 1904. The Mill. 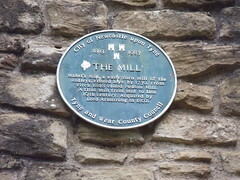 Mabel’s Mill, a water corn mill of the Ridleys, existed here by 1739. From circa. 1848 called Heaton Mill. A flint mill from mid to late 19th century. Acquired by Lord Armstrong in 1862.